Szpital Na Wyspie Sp. z o.o. 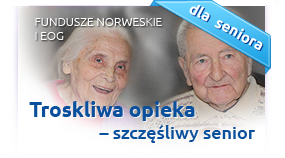 in Żary, in accordance with the received decision of the Minister of Health MZ-FEPP-9022-8/CE/14 of 16th September 2014 started the implementation of the project "Improvement of health care of the elderly, dependent and chronically ill people from Żary and Lubsko and the rest of the southern area of the Lubuskie province". instructing and educating patients and their family members in the scope of nursing, improving, self-care and self-rehabilitation as part of nursing long-term domestic care. The project is co-financed by the EEA Financial Mechanism and the Norwegian Financial Mechanism 2009-2014 as part of the PL07 Operational Programme titled “Development and better adaptation of healthcare to demographic and epidemiological trends". Project value is 1 991 217.00 PLN. Funding value is 1 578 355.00 PLN.